A new space race between Russia, the U.S., and Japan is in the cards. Russian scientists have announced their intention to develop a space-based solar power station, which could be used to transmit energy to Earth. The United States and Japan are currently both working on projects to build solar power stations in space. Meanwhile, Russia has thrown down the gauntlet to both East and West, announcing plans to put the country’s best brains to work on its own cosmic energy venture. The idea of producing electricity in space and subsequently delivering it to Earth was conceived back in the mid-20th century, shortly after the first manned space flight. The project was extensively discussed in both the Soviet Union and the U.S. However; in terms of technological development, both countries recognized that the costs were too great. The U.S. recently returned to the idea in 2009, when Solaren, a Californian startup, promised to launch a commercial 200 MW solar power station by the year 2016. Under the company’s ambitious plans, 250,000 homes in Fresno County will receive their power from space in just four years’ time. If successful, the project will be the world's first instance of an operational orbital solar power station. However, Solaren has not reported any substantive progress in recent years. Vitaly Melnikov is an official representative of the Central Research Institute of Machine Building (TSNIIMASH). “The plan is to arrange a kind of cosmic cluster around the project, which will include companies inside the industry, electronics firms, and universities,” Melnikov announced, speaking at the International Aerospace Congress. The Russian team will have to act quickly — it could end up chasing shadows. “The cosmic energy market is rapidly taking shape,” he said to the audience. “The U.S. is looking to launch a space solar power station (SSPS) by 2016, while Japan has its sights set on 2025. The Japanese estimate that the power generated by an SSPS could be six times cheaper than power currently produced terrestrially,” Melnikov told RIA Novosti. However, cost benefit is by no means the only argument put forward by TSNIIMASH to justify the project. The challenge facing developers of this new type of power plant is the prevention of a global energy crisis. Developers hope to ultimately solve the environmental problems associated with traditional methods of energy production. In Japan, 16 companies, including Mitsubishi Heavy Industries, have combined forces to try to create the world’s first orbital solar power station. The Space Solar Power System (SSPS) project, as it is known, proposes the geostationary deployment of an array of solar panels, approximately 2.5 square miles in area, which will supply 1-1.6 GW of power for consumption back on Earth. Close to 2015, the Japanese plan to launch a low-orbit test version of the system, and by 2025 a fully operational space solar power station is projected to be delivering power to 300,000 homes in the Tokyo area. The project is slated to cost $22 billion. Melnikov says that a “working prototype of an SSPS with a capacity of 100 kW is already in development.” TSNIIMASH has not specified how the Russian space station will differ from its American or Japanese counterparts, but experts point out that all three projects are similar in concept. Special apparatuses in geostationary orbit will concentrate solar radiation and directly convert the energy into electricity. The energy will be transferred to Earth using a laser or microwave transmitter. The Russian team is likely to opt for the laser method: to begin with, it is safer; secondly, the technology is already being developed by Energia Rocket and Space Corporation and Lavochkin Research and Production Association. 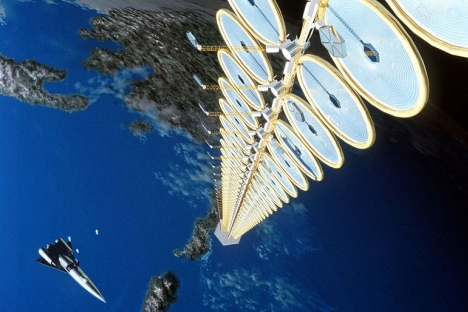 Space-based solar power stations would be exponentially more efficient than terrestrial solar power stations. According to scientists, light scattering and absorption by atmospheric water and gas molecules consume about 35 percent of the energy contained in photons. In addition, ground stations are operable only in daylight hours and under favorable weather conditions. Overall, these factors reduce the total potential of terrestrial solar batteries by 75-90 percent, while the same stations in space would encounter no such difficulties. Still, many experts do not share the optimistic outlook of SSPS developers. In an interview with Vzglyad newspaper, Sergei Kondratiev, a senior specialist at the Russian think-tank Institute of Energy and Finance, cites high start-up cost as the main problem. According to expert assessments, “the project outlays will be ten times higher than those of conventional power plants.” The two main factors are the need for special materials and the cost of putting the system components into orbit. “The idea is good in principle, but only in the long-term perspective,” Kondratiev sums up.